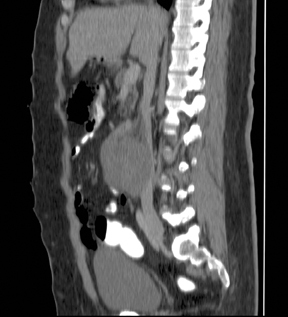 Contrast-enhanced CT of the abdomen and pelvis with coronal and sagittal reconstructions (Figures 1, 2 and 3) revealed a 7-cm homogeneous, well-circumscribed, soft-tissue mass just caudal to the third portion of the duodenum to the right of the midline with marked compression of the inferior vena cava. No lymphadenopathy was identified. A diagnosis of pure seminoma, likely metastatic, was made by on image-guided biopsy. A testicular ultrasound was performed after to diagnosis and showed only a small right hydrocele with no focal masses or calcifications. The mass was surgically resected, and the patient declined an orchiectomy. After 3 cycles of platinum-based chemotherapy, the patient’s tumor markers have normalized. Patients with retroperitoneal germ cell tumors usually present after their tumors have reached large dimensions. The differential diagnosis of a homogeneous, soft-tissue mass in the retroperitoneum includes lympho ma, metastasis, soft-tissue sarcoma, malignant fibrous histiocytoma, and neurogenic tumor. Diagnosis is based on biopsy with adequate tissue for microscopic examination, flow cytometry, immunostaining, and other molecular studies. Extragonadal germ cell tumor in the retroperitoneum is rare. 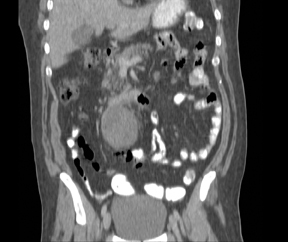 Although imaging of this tumor is somewhat nonspecific, this rare entity should be considered in the differential diagnosis of a male patient presenting with a single, homogeneous, soft-tissue mass occurring at or near the midline, especially if in the mediastinum or retroperitoneum. Scholz M, Zehender M, Thalmann GN, et al. Extragonadal retroperitoneal germ cell tumor: Evidence of origin in the testis. Ann Oncol. 2002;13:121-124. Dubey RB, Sachdev YP, Hegde AN. 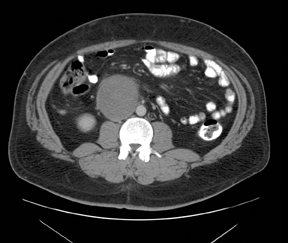 Varied appearances of extragonadal germ cell tumors on radiographs and CT: A Pictorial Essay. Ind J Radiol Imag 2004;14:3:273-278. Sachdeva K, Makhoul I, Curti B. Extragonadal germ cell tumors. Medscape.com. http://emedicine.medscape.com/article/278174-overview. Updated December 2, 2011. Accessed February 28, 2012. Ueno T, Tanaka YO, Nagata M, et al. Spectrum of germ cell tumors: From head to toe. RadioGraphics. 2004;24:387-404. Comite CV, Renshaw AA, Benson CB, Loughlin KR. Burned-out primary testicular cancer: Sonographic and pathological characteristics. J Urol. 1996;156:85-88.